Just a heads-up to say that my old fanart for the manga 'Deathnote' is used with permission on a fanlisting site by Rinoa! 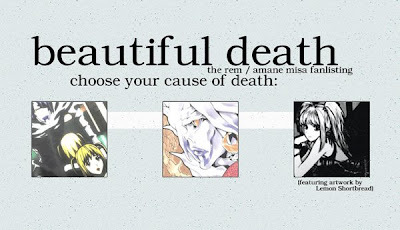 If you love Deathnote & are looking to get listed in a Remu & Amane pairing fanlisting, check out the link below! Back in early 2005 I decided to do a fanart of a brainy, favourite manga artist, thriller-sci fi manga called 'Deathnote'. It is about a boy Yagami Raito (Yagami Light) who possesses the note book of a grim reaper and outwitting another genius to hide his identity as the idealist saviour who uses the noteboook to kill off criminals for a better world. In the police's eyes this 'saviour' is no better than a murderer. Oh and to make things juicier, his dad is the head of the police department. Deathnote is also made into a 2- part live-action movie, a spin-off movie and an anime series. After the first fanart of the scary looking boy-grim reaper pair I followed up with the fanart below. The goth girl is called Amane Misa and her shinigami (grim reaper) is called Remu. Of course I thought Remu was UBER cool. Like I had to draw all the little itsy bits of bones sticking out just to do her justice (And yes Remu is apparently female). It was made in pen and black markers but I ran out of ink so used Photoshop to colour in the rest of the blacks and grey... I lost interest halfway, so the picture was incomplete. Glad people still likes it though! I have a taste for horror, but seldom do horror artworks.. you know why! This is wonderful! My 12 yr old sister kept going on about Deathnote so I rented the film and LOVE it... I keep meaning to do a review on my blog. I'm taking her to Cosplay in May, and she is dressing up as Misa!